Since 1985, the same product you love and remember is sold here. STOP THE INFESTATION ! ! Protect Your Family From Biting Insects All The While Cleaning Your Carpet Destroy Dust Mite, Flea, Tic, Bed Bug, Carpet Beetle and any other Insect Egg lingering deep in the fibers of your carpet Get Ready for visitors with our CEDAR-AL Carpet Shampoo ! CEDAR-AL Cedar Oil Carpet Shampoo contains specialized emulsifiers and chelates to remove even the most tenacious soils and stains. CEDAR-AL Cedar Oil Carpet Shampoo is safe for all carpet and upholstery machines (Hoover, Bissell, Commercial, etc) . Aids in reducing hard water build-up with regular use. AND is the best natural non-toxic pest control ! Enjoy the clean woodsy aroma while ridding yourself and your animals of these pests naturally and safely. CEDAR-AL Cedar Oil Carpet Shampoo Steam Cleaning Concentrate was designed for use in all types of hot water extraction equipment. There are no harsh chemicals which can wear or corrode expensive parts. 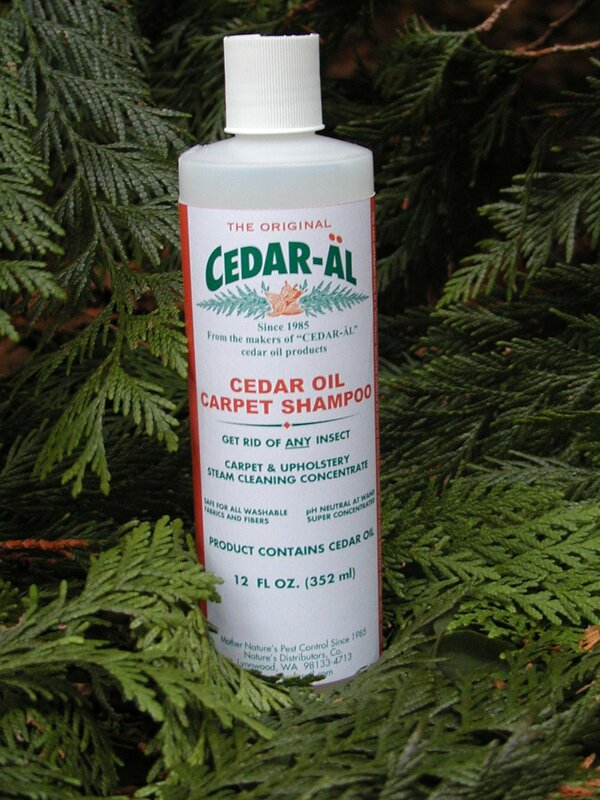 CEDAR-AL Cedar Oil Carpet Shampoo is safe for all types of carpets and upholstery. Because it is pH neutral, it is safe for expensive wools and silks. CEDAR-AL Cedar Oil Carpet Shampoo contains no catatonics and is safe for use on stain resistant carpets. CEDAR-AL Cedar Oil Carpet Shampoo is very powerful and effective in removing many stubborn stains from carpet and upholstery fibers. It is mild (pH 9 in concentrate). The high dilution ratio combined with the low meter settings considerably reduces the use-solution cost per gallon. CEDAR-AL Cedar Oil Carpet Shampoo is the best value in time savings, economy and effectiveness of cleaning.Our twelve ounce bottle contains the ONLY and finest blend of cedar oil and carpet shampoo available! Use in combination with our CEDAR-AL Cedar Oil Spray and Shampoo to give you, your family, your home and your pets a pest free environment. Get ready for visitors with CEDAR-AL ! Give cedar as a gift to use year round ! This 12 oz bottle contains the ONLY and finest blend of cedar oil and carpet shampoo available! Please refer to our How to Use article to learn how to use them. PLEASE INCLUDE A VALID EMAIL ADDRESS ON YOUR ORDER IN CASE WE NEED TO REACH YOU !!!!!!!! Disclaimer: All of our customers' information is private and confidential. We do not share email addresses, phone numbers, or other private information with third parties. We only send out 2 emails a year, once in the spring before bugs hatch, and coupon codes for discounts during the holidays. $5.00 flat-rate per order of 5 bottles. Ships within 3 days to United States addresses only. Additional shipping charges may apply if your order is larger than 5 bottles. Back in the early 80’s Glen Orr was taking a leisurely lunch break in a lumber yard when he saw a deer rolling in a pile of cedar chips. Curious, he asked his boss if he knew why the deer was doing this. He learned that deer instinctively know that cedar keeps off tics and fleas off, and are known to roll on fallen cedar trees for this reason. Glen set about extracting cedar oil from the Northwestern Red Cedar tree by putting shavings into a steam distiller made from an old hot water heater. He worked closely with a chemist from a lab in Seattle to blend the extracted oil with water to make it safe to use on humans and pets, while keeping it strong enough to be an effective natural bug repellent. The chemist also blended the cedar oil in a natural baby shampoo formula and it became as popular as the cedar oil. In 1985 CEDAR-AL, Scandinavian for cedar oil, was born. The same lumber yard and laboratory still work together to provide CEDAR-AL customers with the same cedar oil they have come to love. Eddie Bauer stocked CEDAR-AL cedar oil and pet shampoo on every shelf of every one of their stores for over a decade, until they discontinued most of their outdoor items to become a clothier instead. Glen Orr walked off into the woods never to be heard from again. His partner, Roberto Martinez was left holding the remnants of Glen’s dream. CEDAR-AL remained dormant until 2005 when Roberto met, fell in love, and married Elise Crawford. With her children nearly grown, she gladly hung up her nurse’s cap and worked alongside Roberto to nurture CEDAR-AL back to life. Since then, a new label was created for CEDAR-AL, two new products have come on board, cedar oil carpet shampoo and an enzyme cleaner, Triple Action Plus, and an online store was created. When a photo of the original label was posted on the website, former Eddie Bauer customers flocked to the website, so relieved that CEDAR-AL wasn’t lost to them forever. "We use the cedar shampoo for our dog and our son's dog. We use the cedar spray for the bedding, small amount under his bedding. Plus I spray in our musty cellar. I also spray around the door ways and windows to help keep bugs away. I spray in my cedar closets to freshen them up also. I put on cotton balls under furniture and in cupboards to freshen those places. It is sprayed on cotton balls and I make little scarves for my pets, with that oil and lavender that I grow to repel fleas when he is playing outside. I use it actually everywhere. Also in my blanket chest to store seasonal clothes and blankets. Soooo much better then moth balls. Spray my screens with it. I love the stuff, as you can see. It is simply a wonderful fresh smell. Some goes in my wash water every once in a while to wash floors also, just a tiny amount. There are many uses for it. I dilute it in a spray bottle with water to spray around my house and closets. So as not to be too strong or irritating to the nose or skin if comes in contact, plus it helps to go further for me as I do use it a lot!!! Thank you for your wonderful products. I always tell people about you, keep up great smelling products!" 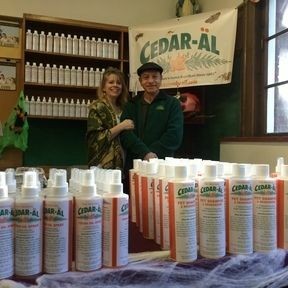 Welcome to cedaroil.com the home of CEDAR-AL products. We are a family-based business since 1985. You may remember our products sold at Eddie Bauer before they switched to an outfitter store. The same product you love and remember is sold here. Our mission has always been to provide natural and environmentally safe products. We pride ourselves in that we give customers another choice, a safer alternative, rather than one with long term risks in comparison to systemic risky topical flea treatments and DEET products. Do you or your pet scratch? Allergic to bees or mosquitoes? Has your cedar chest lost its scent? Check out our CEDAR-AL products for almost every need in your home, for your pets, and for any outdoor activities. CEDAR-AL cedar oil is colorless and safe to use on most fabrics.